On September 24, 1272, Prince Edward of England, leader of the Ninth Crusade, left Acre (Syria) for Sicily to recover from wounds. There he heard of the death of his son and later the death of his father. 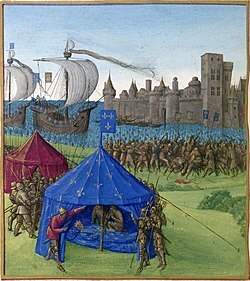 The evacuation of Edward marked the end of the Ninth Crusade, the last of the Medieval religious Crusades (though there is sometimes referenced a Tenth Crusade that is not really related to what we think of as the Historical Crusades). Edward’s wounds were caused by an assassin wielding a poisoned dagger. Though Edward was able to kill the assassin, the dagger left a festering wound. In 1273, Edward had recovered enough to continue his travels home to England, where he arrived in 1274 to be crowned King Edward I. Edward was known as ‘Edward Longshanks,’ and also as ‘Edward, Hammer of the Scots.’ Edward was the first son of King Henry III of England. 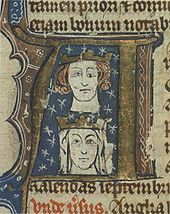 Early fourteenth-century manuscript initial showing Edward and his wife Eleanor. The artist has perhaps tried to depict Edward’s blepharoptosis, a trait he inherited from his father. With too small an army to face major Muslim forces, Edward conducted raids, achieving some success after helping to lift the siege of Acre. Reinforcements arriving from England emboldened Edward to more ambitious raids, and even larger reinforcements came with the addition of 10,000 horsemen from the Mongols whom Edward had courted as allies against the common Muslim foe. Unfortunately for Edward, the Mongols assisted for short time before heading back to their own territory. Baibars went on the offensive against the Crusaders by building a fleet of warships and disguising them as Christian ships for an assault on the Christian stronghold of Cyprus. The Christian fleet destroyed every one of the 17 Mamluk war galleys and the invasion of Cyprus was thwarted. Unable to create a powerful coalition of Christian forces to retake Jerusalem, Edward brokered a peace with Baibars whereby the Mamluks would retain Jerusalem but would give free access to Christian holy sites to Christian pilgrims. Only after the treaty had been reached was the assassination attempt on Edward made. Thus ended the Ninth and final Crusade, leaving only the Sack of Alexandria by the King of Cyprus in 1365 as considered by some to be the “Tenth Crusade,” though that action was primarily an economic action rather than religiously motivated. 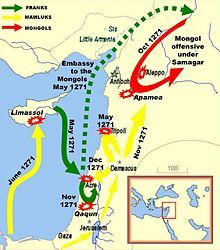 The Ninth Crusade was nominally successful in that Acre and Tripoli were saved from siege, although the goal of taking Jerusalem back was not realized. The era of Crusades has left a lasting mark on Christian-Muslim relations ever since, with any mention of the word “Crusade” to describe a military action by Western nations treated with horror by Muslims. Do you think the Ninth Crusade was a success or failure? Do you think the Ninth Crusade was really just part of the Eighth Crusade? What do you think of the Crusades in general? Feel free to share your thoughts on the subject. Asbridge, Thomas. The Crusades: The Authoritative History of the War for the Holy Land. Ecco, 2011.